Did you Know About the Kinshasa Cowboys? Cecilia Zoppelletto writes about the genesis of her documentary feature La Belle At The Movies, which has its world premiere this weekend as part of Film Africa 2015. In a stream of images and words that have always shown us the Congo as a land of desperate people torn between war, human rights violations and poverty, there is a story of joy never told. I found this joy in Kinshasa’s cinema culture, alas abandoned by any sort of financing, but very much alive in people’s hearts. In 2013 I took my first trip to Kinshasa and like any tourist I looked around to spot the differences of the new urban environment from that of my home. I was stunned to see that amongst all the city buildings there were no cinemas and out of all the billboards there wasn’t one promoting films. From that moment on it became part of my repertoire at every lunch or dinner in Kinshasa to ask “why aren’t there any cinemas?” Nobody could really answer, although everyone talked about their favourite movies, where they saw them and with whom. Like film fan postcards from another, very different time. At that point I was hooked, I really needed to find out what had happened to Kinshasha’s cinemas, so the next May I went back to Kinshasa with cinematographer, editor and co-producer Paolo Camata.What an adventure that was, we were almost arrested one day and celebrated with a party the next, Kinshasa is a city full of surprises and characters that embody the city spirit. When I met Charles Wamba in his VHS rental shop I thought he incarnated the essence of the city. Ready to negotiate, do quick business and at the same time there to protect a tradition. His smile says it all, and every time I watch that sequence I see he is the real Kinois (Kinshasan). In the words of Wim Wenders “Films can heal” and nothing could be more proof of that than Kinshasa’s own home grown cowboys. The 60s were a moment of transition for Congo with many people searching for a sense of identity, and many young men took inspiration from the imaginary world of the Spaghetti western, which they re-enacted by dressing like their heroes. 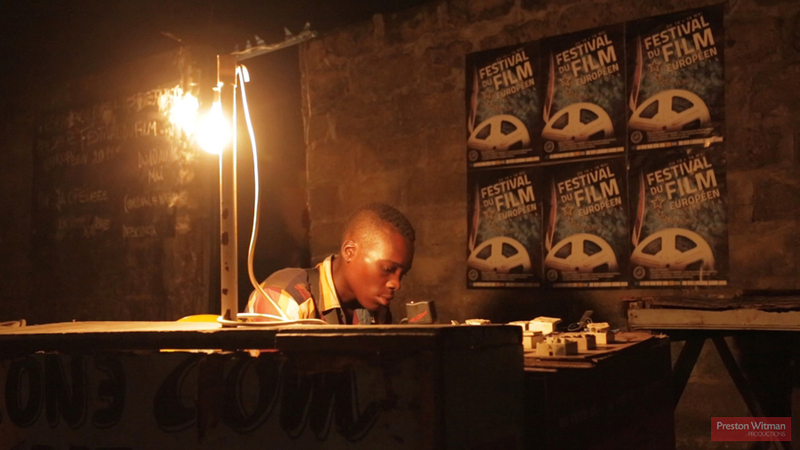 This Saturday 7 November is the world premiere of my film about Kinshasa’s relationship with cinema. I hope it will start a different conversation about the Congo, about its artistic population and their aspirations to make films and to show them to a generation that has not yet been to a cinema theatre in their city. La Belle At The Movies screens as part of Film Africa 2015, at the Hackney Picturehouse. Best of luck for your film.